The French Georges de La Tour was a committed catholic painter. His work, after his death, was soon forgotten until the beginning of the 20th century when was rediscovered. We set the painter in the baroque movement, but he is also considered the best example of french tenebrism. What does a “tenebrist” mean? Basically, that follows the way of handling light (and, above all, darkness) from Caravaggio, the first tenebrist who, after some time, several artists imitated. If you look at the painting, you would realize why de La Tour is called a “tenebrist”…. In short, as we don’t know many facts of de La Tour, we don’t know if he knew Caravaggio’s work or if he learned to handle light by himself. What we do know is that de La Tour was influenced by the Utrecht School, that is, a small group of Dutch painters who followed Caravaggio’s ways. But there are some differences: while in Caravaggio the light comes from imprecise sources, de La Tour, is known for having the light to come from specific elements such as candles, torches, oil lamps, etc. De La Tour paints different motifs, especially religious, but he also works gender and devotion scenes. The curious thing is that he treats these motifs the same way, and it is not easy to distinguish one from another. While Caravaggio paints very dramatic scenes, de La Tour prefers tranquil, intimate and, often, every day scenarios. 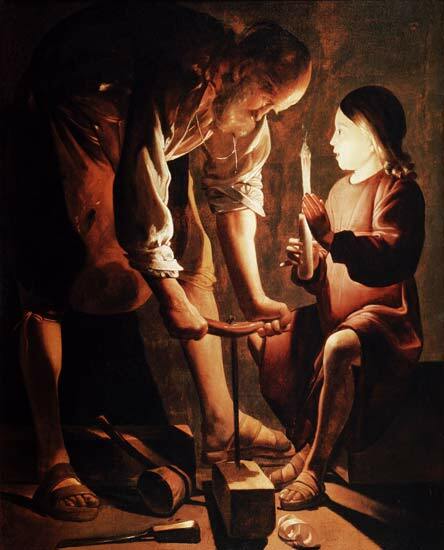 The canvas St. Joseph, the carpenter refers, if you have any doubt, to the boy Jesus (or Christ) and his father Joseph in, what we may guess, is his workshop. Is a private scene, where the soft light from the candle Jesus is holding lightens all the details from the characters. In Joseph, we can see a harsh face, consequence of years of work; maturity, with their characteristic wrinkles; but what I like the most is the expression of silent patience. In the other range, there is Jesus holding the candle, the only source of light in the room. It seems like he is chattering with his father while he listens quietly, keeping with his work. The boy’s expression is of joy and, at the same time, curiosity. His face brights differently than in the rest of the painting, almost like it is glowing. And, of course, this has a metaphorical sense: in the bible, Christ is compared to the light of the world who came to save the ones that are in darkness. ~ by Álvaro Mazzino on July 30, 2010. I think the way the Christ child’s hand is made almost translucent by the light of the candle is one of the most amazing accomplishments in this work! – 6 months into their Linux learning experience I wouldn’t hesitate to recommend Fedora Linux 10.
technology offered in the new ZR-1 Corvette. I relish, cause I discovered exactly what I used to be taking a look for. I know you must be confused at the beginning of the color theory because most people only talk cold and warm, right? Lucky you! Now there’s information on being neutral. It means you look great with either metal and most colors. This entry was posted on July 30, 2010 at 10:16 and is filed under Baroque.You can follow any responses to this entry through the RSS 2.0 feed.You can leave a response, or trackback from your own site.